I’m a big fan of Jay Rogers‘ art. The former Cartoon Network art director turns out some fantastic work – clean, appealing and always professional. Skilled in both design and illustration, Jay has done work for an impressive list of clients, including Walt Disney Imagineering, American Greetings, Penguin Books and many more. He’s worked on projects for Universal Orlando and the upcoming Shanghai Disneyland. And now he can add PixArt to the list! We’re so honored and grateful that Jay took some time out of his busy schedule to create this super-fun take on Woody and Buzz Lightyear. Check out his website for more fantastic images and projects. Take a closer look at the artwork he created for us and read more about him after the break! I love all of them – each one raises the bar from the previous film and continues to push the genre into new territory. If I had to choose one, The Incredibles is at the top of my list. I’m a sucker for a good superhero action flick and boy does it deliver! Day/Night. 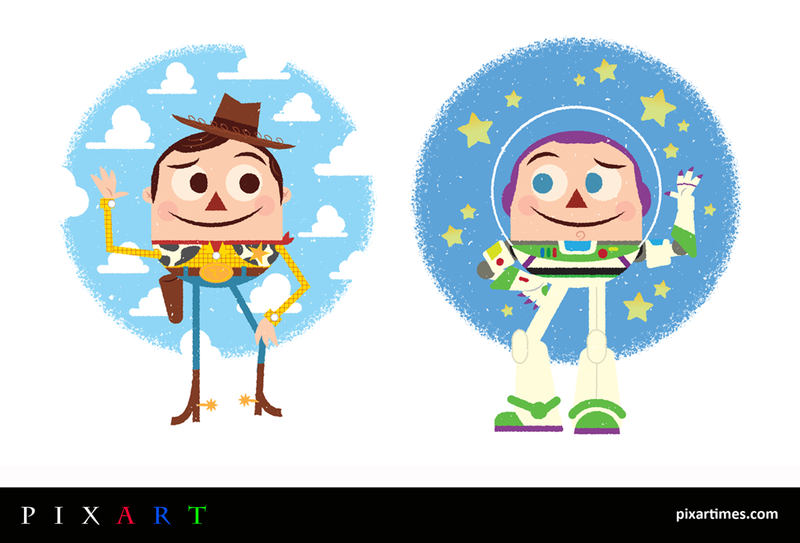 I love the character design and how it flips the traditional Pixar 3D/2D relationship. Toy Story really started my longtime admiration of Pixar, so I thought it fitting to tip my hat and do a version of Woody and Buzz. Man, that’s so hard. Everyone; everything. I try to keep my eyes and ears open and react to what’s coming in. I have a particular soft spot for Tiki-era madness, UPA and Mid-century cartoons and culture, 80’s pop culture, science fiction, vintage Disney, SHAG, Tim Biskup, my former colleagues and friends at Cartoon Network, ALL my ridiculously talented Twitter pals, the fine folks at MailChimp, and the art of screen printed posters (Methane Studios, Aesthetic Apparatus, Standard Deluxe, The Decoder Ring, etc.). In addition to my design and illustration career, I’m the CEO of The League of Certain Peril – a mysterious and secret organization. It affords me a monkey butler/bodyguard named Higgins, and a vault full of eyepatches in our sub-aquatic lair. If you’d like to be considered for a PixArt feature, send us a link to your portfolio for consideration. Contact Us today!